I have wanted this pistol since I saw it introduced a couple of years ago. The pistol is manufactured by Pedersoli of Italy and, at the time, nobody could give me any information on who was importing them. Then, by chance last year I spied them in the Taylor's & Company catalogue right before a trade show in January. On the day of the show I hustled to the Taylor's booth and found a treasure trove of beautiful single action revolvers and lever action rifles and carbines. Smooth trigger pulls and buttery-soft actions abounded. However, no Howdah pistols. "Very difficult to come by" the Taylor's representative told me. 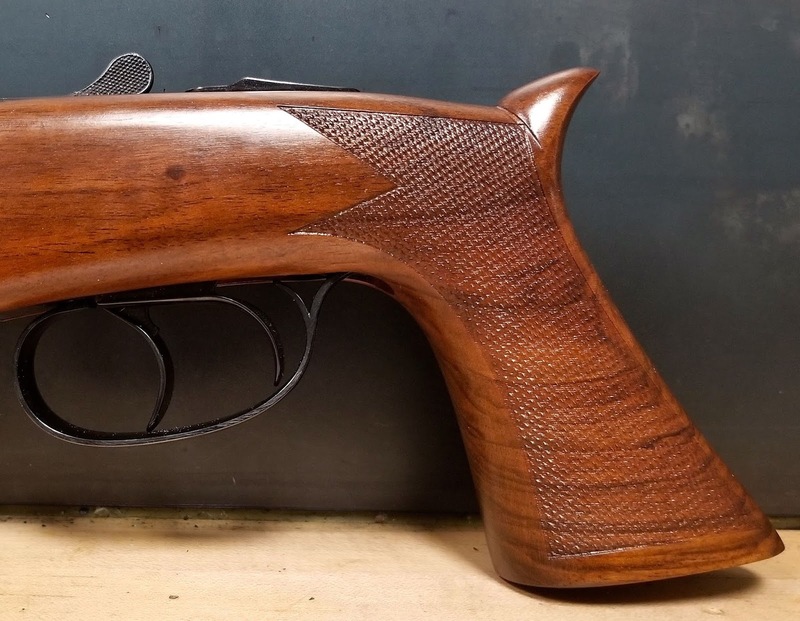 Then, a few weeks ago I was ordering a couple of Taylor's rifles for a customer and asked the rep. if he had any of the .410/.45LC pistols in stock. I was shocked when he told me that they had recently received a shipment from Italy. I couldn't wait to finally get my hands on one, but more on that later. The Howdah pistol is a recreation of the Ithaca Auto Burglar shortened shotgun produced from 1922 to 1933. 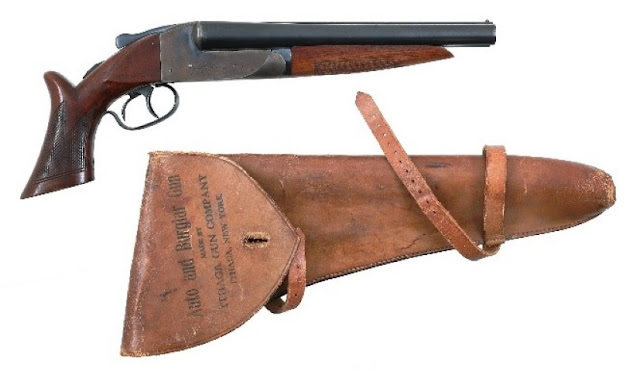 Ithaca produced the Auto Burglar in 20 gauge with a small variety of grip styles. The most identifiable being the saw-handled grip with the spur that keeps your hand from riding up over the safety during recoil. I have seen a couple of people shooting the Mossberg "Shockwave" 12 gauge who needed bandaids after the safety tore into the web of their hand. Ithaca also produced a belt holster for the pistol however, I would imagine this was more of a case for storage and transportation rather than an actual mode of belt-carry. This would have certainly been a handy homestead firearm if something went "bump" in the night. Also, in the 1920's, traveling by automobile could be a lonely and sometimes sketchy pursuit. Interstate highways were a long way off and what are now considered "the back roads" were the only roads at the time. You could also drive hundreds of miles without seeing a police officer, Sheriff's deputy or highway patrolman. A short, double-barreled 20 gauge shotgun could be a welcome companion and a confidence builder in your uncertain travels. During it's 11 year run Ithaca produced about 4,000 models.  Production was halted in 1934 with the enactment of the Firearms Act of 1934 that required a $200 Federal tax stamp be applied for and purchased if one wanted to own a shortened shotgun. That brings us up to current where some brilliant person at Pedersoli realized that the Auto Burglar could be reproduced as a fully legal pistol if the barrels were rifled. This has been the case for many years with Bond Arms Derringers and the Taurus Judge both in .45 LC and .410. And the Pedersoli Howdah is a wonderful pistol to behold. Deep blue steel, case hardened frame and checkered walnut stocks. Just as God had intended. No polymer, no synthetic, no MIM, no Cerakote. Absolutely beautiful. 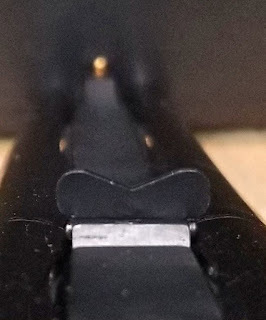 The sights are a raised gold bead with a folding rear leaf and provide a good sight picture at at its intended ranges, which are fairly short. I was fairly amazed with the trigger pull. The Howdah is not an inexpensive pistol and the fit, finish and trigger pull show that quality does have a price...and it's worth it. This is not a bird gun. The Howdah is purposely designed as a back to the wall, closed quarter defensive tool. And I think it works. The safety automatically engages every time the action is closed. I like this feature but some people that have shot it have a difficult time remembering that the safety is always "on". The Howdah is a short-range pistol. 25 yard shots with a .410 shell have not been attempted. For the purposes of today's shooting I used Federal Premium Person Defense 000 Buckshot with 4 pellets in a 2.5 inch shell. So here's what I like about the Howdah. You pull the trigger and 4 holes instantly appear! The above target was shot at a scant 5 years. Moving out the 7 yards the shell's wad hit a perfect bullseye but my four 000 pellets went high. 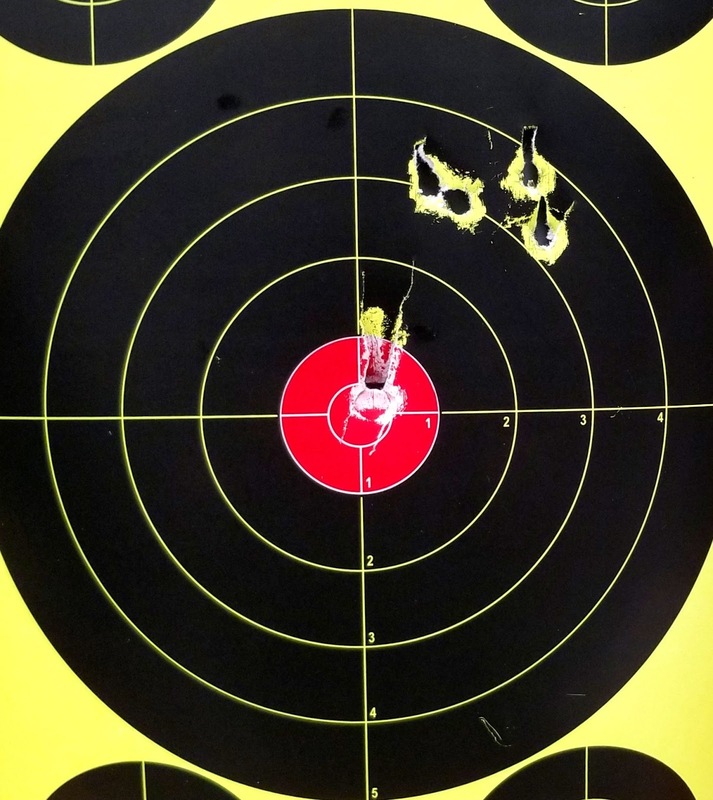 Out at 10 yards my center point of aim put my pellets into the small bullseye at the upper right hand corner. 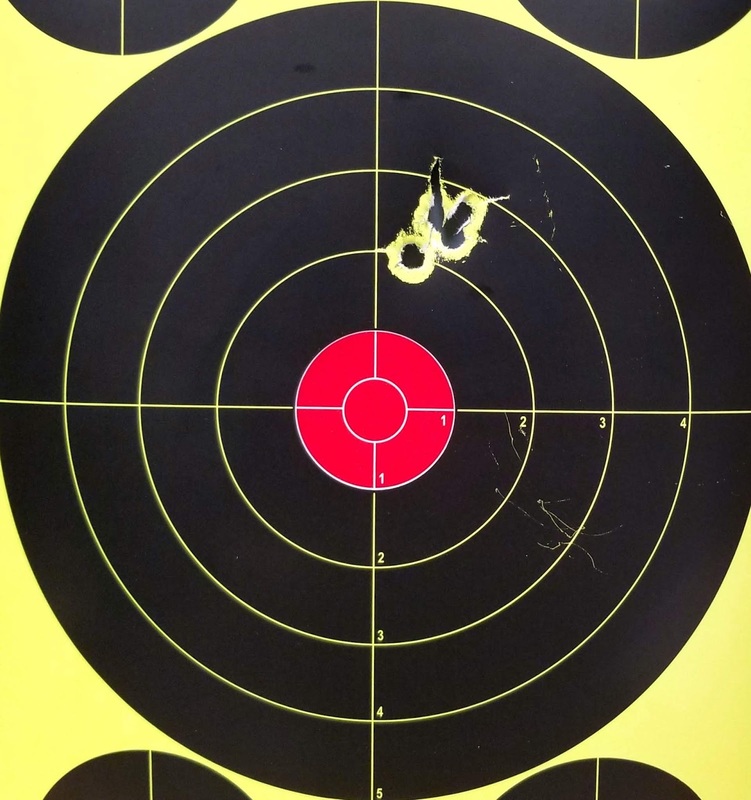 In the rest of the target I am lowering my point of aim to bring the pellets down with the bottom four hitting low right with the brass bead centered just below the 5 ring. There is one thing that I am doing that may be pushing my shots high. For some reason my mind has not wrapped itself around that fact that the recoil is much less than I am expecting. In other words I flinch horrendously. 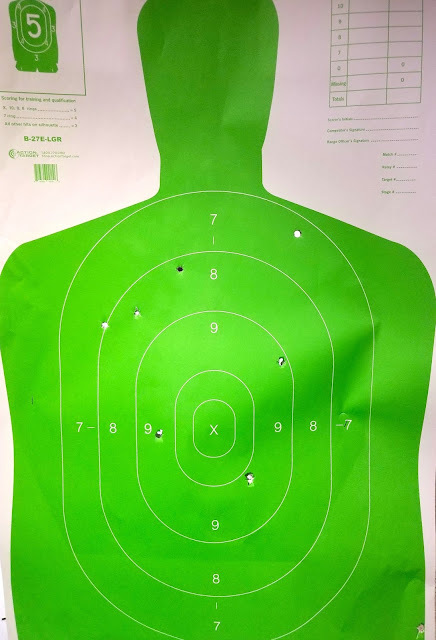 And...I'm kind of OK with that...means I need to practice more. While I do consider the Howdah to be a close quarter firearm, I did run a man-sized target downrange and fire two 000 shells out at 25 yards. 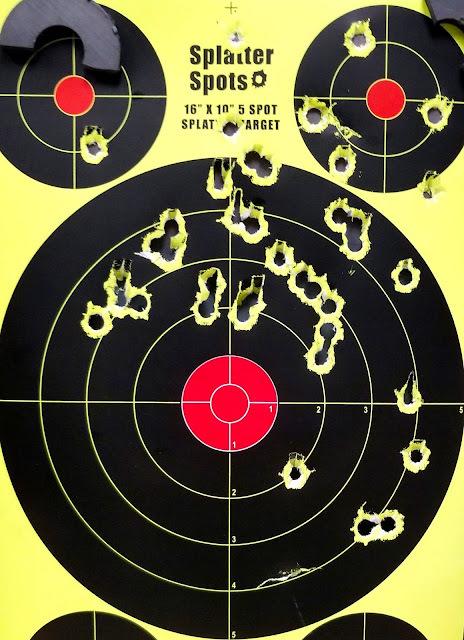 Seven of the eight buckshot pellets struck the torso with three of them landing in the 9 ring. Not too bad. 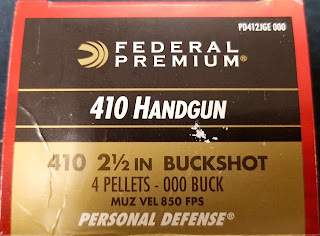 Many people poo-poo the 410 for defense and I would tend to disagree...depending upon the barrel length and the load. The 10.25 inches of barrel gives more performance than the snub-nosed variety of revolvers that have become popular. There are "00" and "000" defensive loads in 2.5 and 3 inch shells that contain 4 to 5 pellets of each sized buckshot respectively. At close quarters this would definitely be an attitude adjuster. I have not shot .45 LC rounds and I may not. While they would certainly be potent coming out of a 10.25 inch barrel, there are other tools available that hold more ammunition and may be more accurate. I'm sure that curiosity will eventually get the better of me but I plan to keep it true to it's Ithaca Auto Burglar history. Is this the best firearm for defensive purposes? Hardly. Is it the best handgun for defensive use? No. But few other firearms as a classy and as fun to shoot as this one.